Door handles can leave holes in your wall after repeated use. 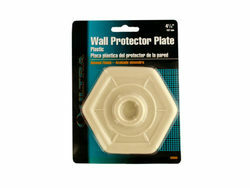 The Wall Protector Plate can prevent expensive damages to your home. This stopper absorbs the impact that a door handle would normally leave on your wall. The Wall Protector Plate is made from plastic. It doesn’t require any hardware to install. Just remove the liner on the sticky back and press against the wall.Comes packaged in a blister pack.